I should wake Cholo up from his sleep. We’re about to arrive in Naples already. He still won’t budge. I’ll wake him in 5 minutes. I feel the Cercumvesuviana slowing down. I stand up and wear my bag over my shoulders and proceed to the exit door. I can see the station now. What is taking Cholo so long!? I see him roll the straps of his camera SLOWLY. I see him put his camera on the seat beside him SLOWLY. I see him open his bag SLOWLY. I see him put his camera inside his bag SLOWLY. The train has now stopped and I am now on the platform. I see Cholo stand up SLOWLY. Everyone who needed to disembark has done so, except for Cholo. I see Cholo decide to ask someone if this is the stop for Napoli Stazione Centrale. He turns to me and tells me it’s the wrong station. The alarm goes off and the doors start to close! I call out to Cholo in panic to tell him to come out, and he decides to ask the guy one more time. When he got the answer he was longing for, he makes a mad dash. Cholo Laurel gets caught between the closing doors. There I was standing in the middle of the train holding on to the pole with one hand and the other on my luggage. I look at Tita Aileen. I then shifted my gaze to Gigi and Blanche. I then shifted my gaze to the route map on top of the doors. I studied the route. I turn to Tita Aileen and we start to discuss where we are to go down. We came to the conclusion that we are to go down in Paya Lebar Station and make a transfer to the East West Line for Tanah Merah Station; where we are to make our final transfer for Changi Airport. The MRT line zooms past apartment buildings and the occasional park. People go down in their respective stations and we start the cycle again. As we were nearing Paya Lebar Station I announced to everyone that we are about to get down. We all stood up when suddenly Nat spoke up. Despite being sick, had the energy to tell us that it was the wrong station. Tita Aileen in a very calm way told him that we are to go down the station because we need to transfer to another train to go to Changi Airport. The alarm goes off and the doors start to close. Tor Torre makes a mad dash! Tor Torre gets caught between the closing doors. The Skyliner has now stopped. I see people standing up and making their way to the exits. “You better do that because you’ve known each other longer.” was my reply. He walks over to the seat in front of us, shakes Tito Ken gently. We make a bee line for the exit with Tito Ken leading the way. Tito Ken makes it to the platform while Cholo and I retrieve our luggage from the stowage area near the exit. We moved around the other passengers luggage in haste. I got to mine first. I turn the corner and to my horror, the door was more than half way closed! I grabbed the handle but it doesn’t seem to stop! I started running my fingers around the side panels of the door, hoping to find a button to stop the damned door from finally closing! My emotions were a blend of stupidity, horror and amusement (which left me dumbfounded!). I turned around and faced Cholo. Tor Torre and Cholo Laurel missed their stop. Don’t sleep. Not unless you’re sure that your stop is at the very end of the train ride. Sleeping will only make you groggy and disoriented when you wake up. Never take your time in a train. Remember that trains keep to their schedules. They arrive and depart with or without you. Always research in advance. Know which routes to take and know at which stop you are to embark or disembark. Always make sure that your luggage is within reach and it’s not piled behind the luggage of other passengers. It takes time to move heavy luggage around. Make sure never to stay at the end of the line, there’s a more likely chance that you’ll end up missing your stop. If you miss your stop, just know that you can always go back from where you came from. Cholo and I were still able to make it to our connecting train from Naples to Rome. Auntie Aileen, Gigi, Blanche, Nat and I were still able to make our transfer to the East West Line for Changi Airport. Cholo and I missed our stop at the Narita International Airport Terminal 2 and found ourselves at Terminal 1.When we alighted, I directly went to a station personnel and told him of what happened. He was very kind in helping us find our way to the other platform where we were to ride a local train that would pass by Terminal 2 on its way to the City. 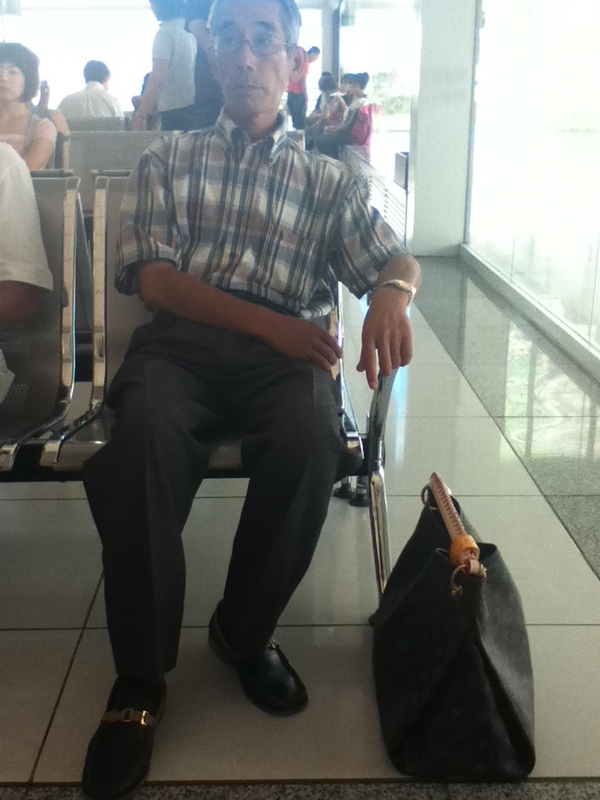 When we arrived at the Philippine Airlines check-in counter we saw Tito Ken standing in line, laughing at us. He already surmised what happened. He told us it’s okay, that happened to him too! Unlike Cholo and I, the reason he missed his stop was because he fell asleep. I stared at him as he walked towards the silver steel bench in front of Cholo and I. “hmmm..” was my bubble thought. I eye him closely without being obvious. I went down to his belt and my eyes widened. My eye traveled down his pants and reached his shoes, my eyes widened even more. Then I saw his BAG. I gasped. “Bubba, look at the old Japanese man sitting in front of us.” I told Cholo in Filipino. “Very Smart!” was his remark. This is the way to fly. No, it’s not about the fact that he is decked with Louis Vuitton from head to toe. It’s about flying in comfort with style. …I do want his bag! To read my previous blog about hand carried luggage, click here. We had just finished going around the different galleries on the first floor of the Tokyo National Museum. “Lets proceed to the second floor Bubba.” says Cholo. “Can we pass by one of the galleries? There’s something interesting I want to try.” I pleaded. This caught my interest and I took a closer look. 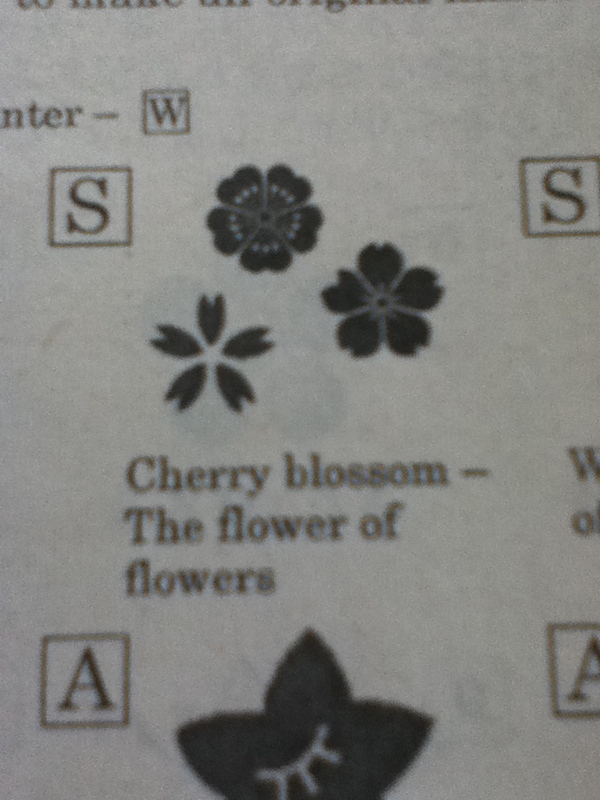 It turns out that many of the Japanese tourists were stamping patterns unto pieces of paper. “I’ll come back later!” making a mental note to myself. I then dashed to the toilet. Just before we headed to the second floor, I went to the gallery where the stamping was happening. As I got closer, an old Japanese man handed me a paper in the shape of a Kimono. He must have seen the unknowing look on my face. Then it dawned on me. This was going to be fun. I told Cholo what we were to do and we stamped away. 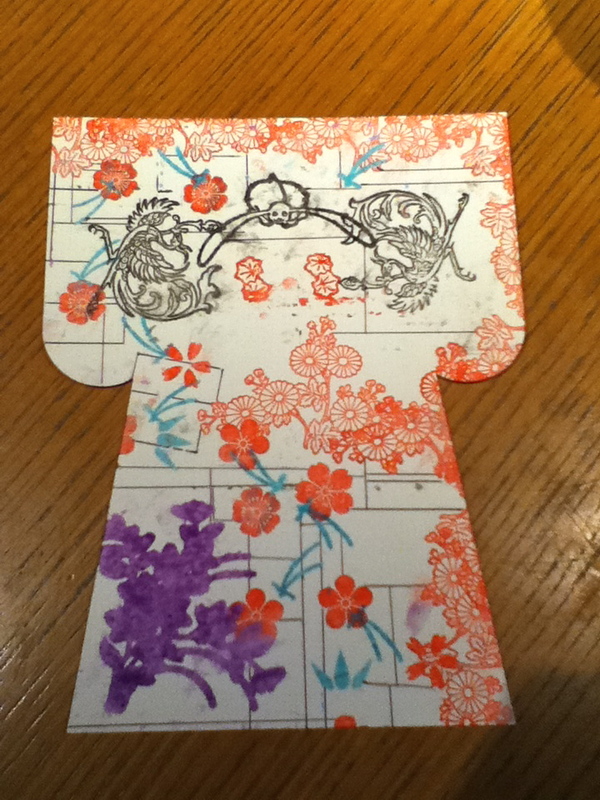 While stamping away, I turned to the old Japanese man and showed him my Kimono. “Oto-san, Kimono daijobu?” I asked. “Hai!” he replied and went on to speak Japanese for 300 kph. Never understood what he said. 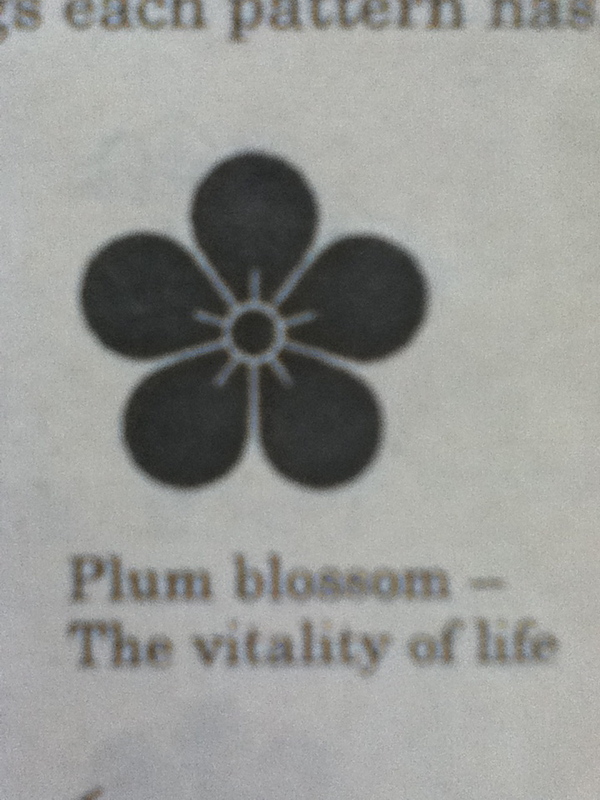 Once I was done, the old Japanese man who gave me the Kimono paper, gave me a leaflet. 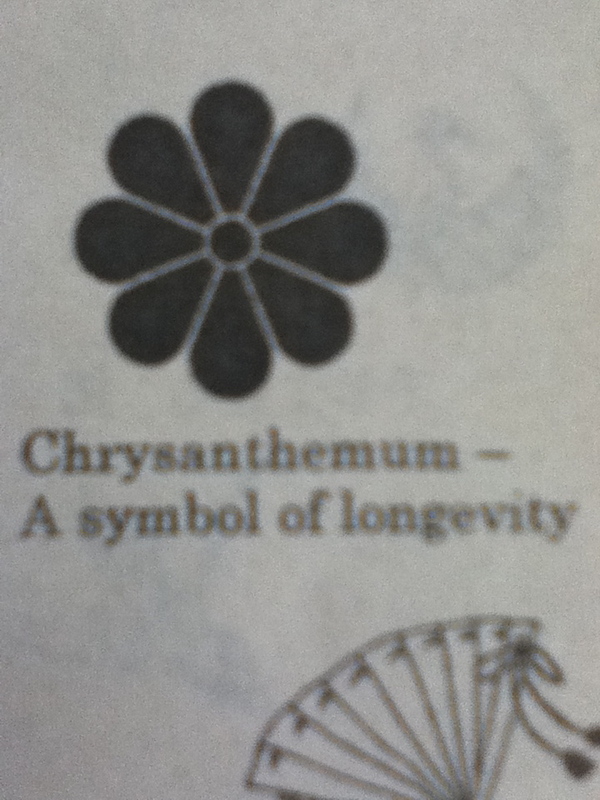 As I perused over it, I realized that every pattern on every stamp had a meaning. 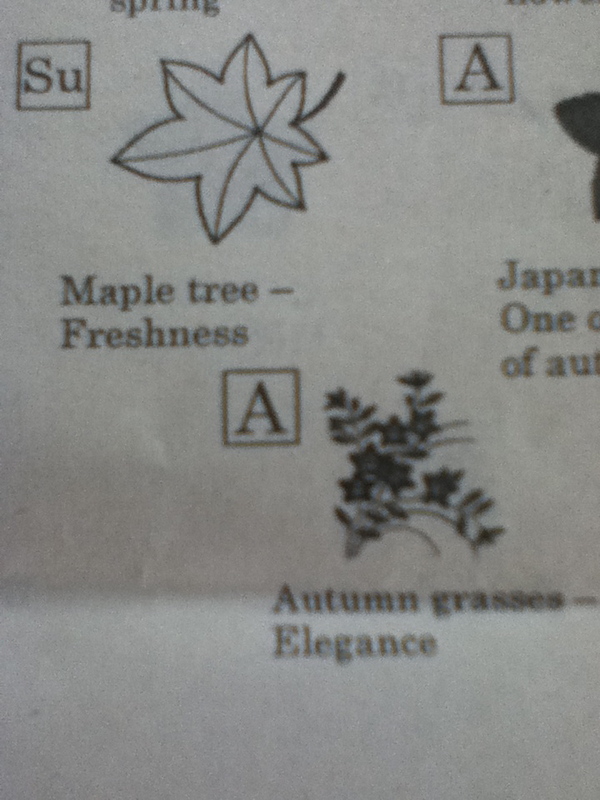 Some symbols have a specific season it belongs to and some are celebratory patterns. It tuns out that my Kimono has design patterns for Spring, Summer, and Autumn. If this was an actual Kimono, I’m sure I’d be laughed at because it is a discombobulation of the seasons. 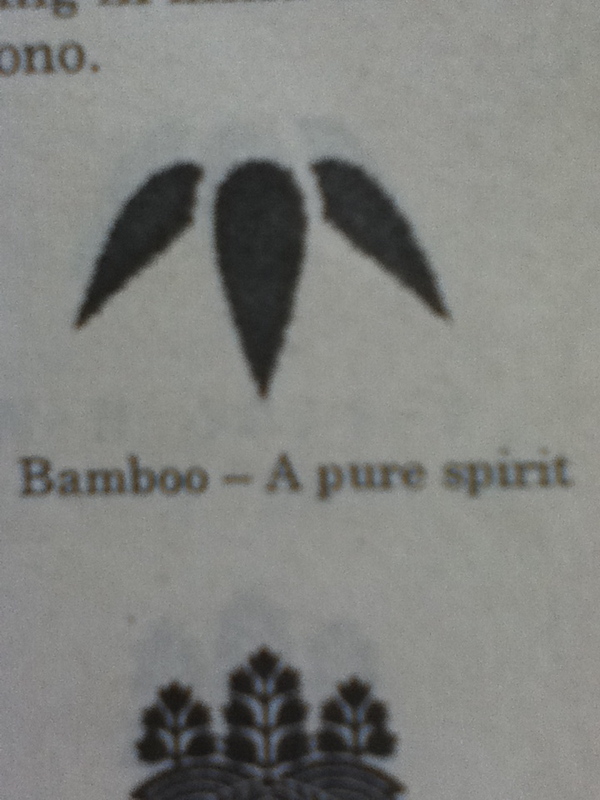 There are some patterns in my Kimono that is not listed in the pamphlet. 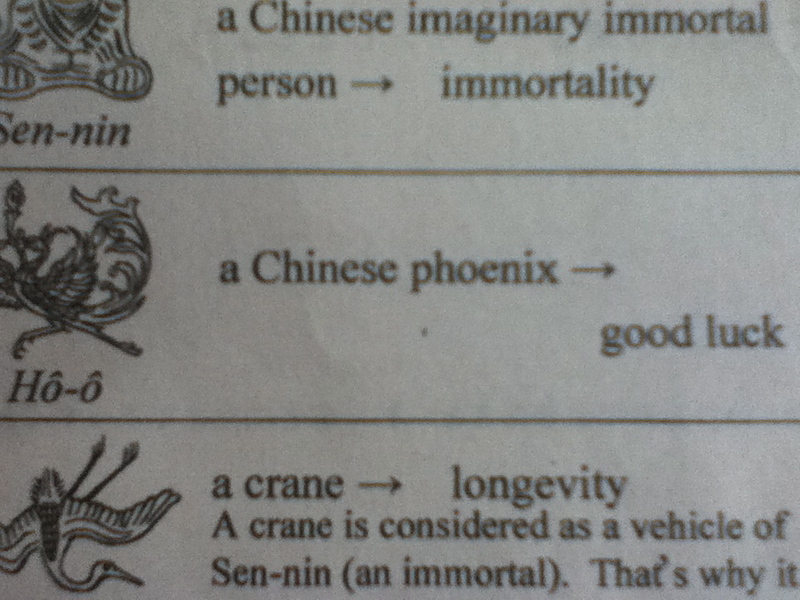 So I will never know what they mean. I truly enjoyed this experience at the Tokyo National Museum. It is not everyday where in you get to have a hands on activity that reflects Japanese tradition and culture. Other museums should follow suit. To get to the Tokyo National Museum, you have to make your way to Ueno Station and make your way to Ueno Koen (Ueno Park) by taking the Ueno Koen exit. Let me just say that there are lots of exits in a train station in Tokyo, and if you go out the wrong one you might end up getting lost. Just ask the station master to point you in the right exit. There are signs inside the park that will point your way to the museum. For a map of Ueno Koen (Ueno Park) click here. Crossing Shibuya Crossing in 33 seconds. 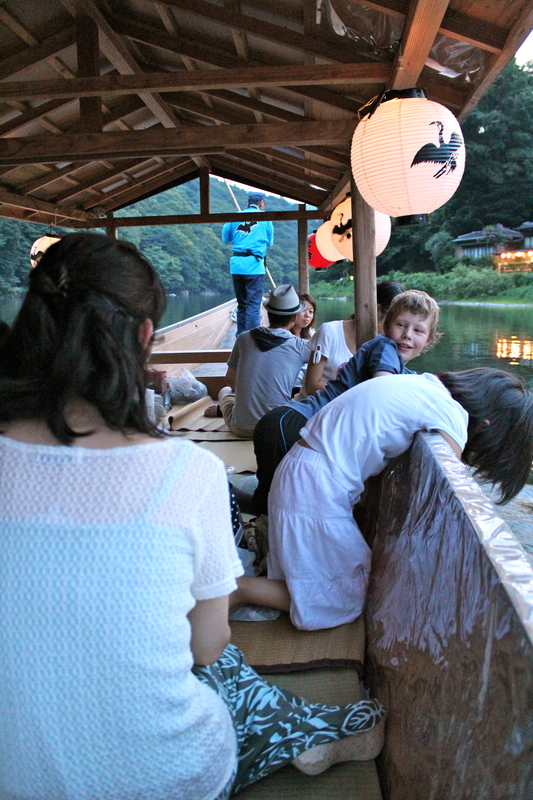 On a boat, floating on the Katsura-gawa. The little Japanese girl in front of me is bending over the edge of the boat feeling the water. I take a look over the edge. “The water is not as deep as a thought.” I said out loud. I look at the other tourists that shared our boat. There’a a Canadian couple with their two boys, a Japanese woman with her two girls and a mix of Japanese tourists up front. I’m beginning to think U KAI is quite an event that even locals come out to watch it. The old man driving the boat with a long pole starts to maneuver the boat. I’ve notice that our boat is starting to line up with the other boats. The audible crackling of firewood signals the event is about to start. 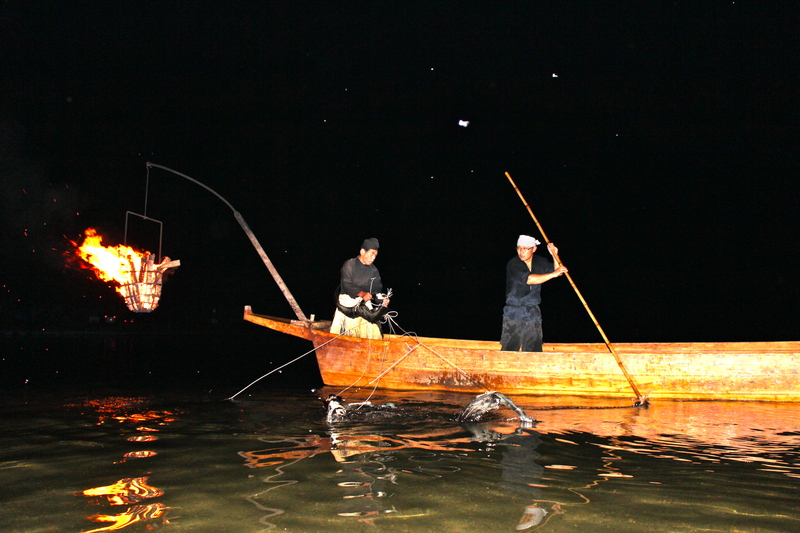 U KAI or Cormorant Fishing is an event to look out for during the summer season in Japan. I have been quite intrigued about Cormorant Fishing ever since I saw an episode about it that air on NHK World. It’s quite amazing to see a seabird “fishing”. You start off the evening by getting unto a boat that will bring you to the middle of the river. You’ll know that the show is about to start because the boatmen start to align their respective boats into one long line. The fishermens boat comes into full view. You won’t miss it because there’s a huge fireball hanging from the end of the boat. This is to attract the fish to come closer to the surface. You hear them quacking first, then once your eyes adjust to the darkness you see these black birds in front of you. With a bang from the pole, they dive into the water and surface in an instant. You hear the fishermen shout something in Japanese. You get lost in translation. You then realize that there’s fish in their throats! One of the fisherman then pulls them over, lifts them from the water and makes the bird spit out the fish. A splash heralds their return to the water. Another banging of the pole unto the side of the boat sends the birds underwater again. The show lasts for an hour. You don’t get to eat the fish. But you do get to experience a piece of history and experience tradition in before your very eyes. The show costs 1,700 Yen for adults and 850 Yen for kids aged 4 to 12 years old. There is a kiosk that sells tickets. Make your way to the Katsura-gawa. Cross Togetsukyo Bridge and turn right after that small kiosk selling souvenirs and walk straigh. 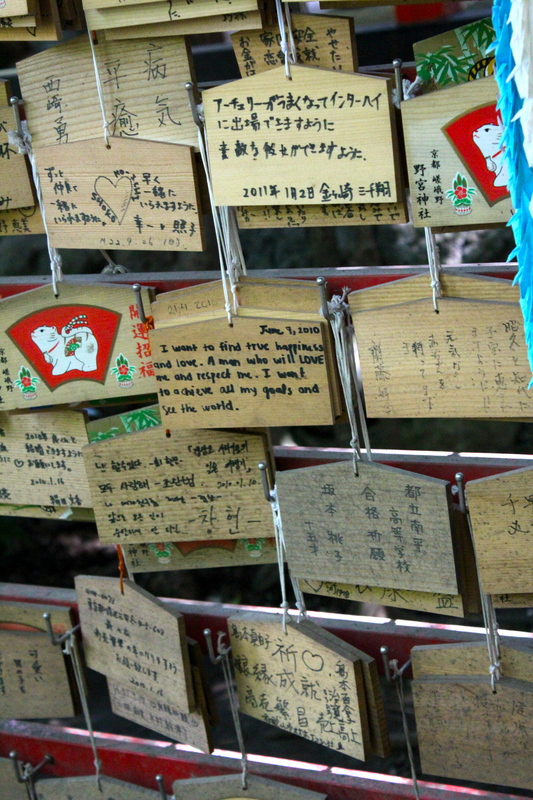 It is located right before you go up the steps to the Iwatayama Monkey Park. “If we walk down this street go straight and turn left, we will end up by Katsura-gawa.” I said to Cholo. “It’s on the map.” I replied. A burst of colored appeared before me. I fell silent. I took out my mom’s camera. The girl passed us by. I turned around raised by mom’s camera and CLICK! 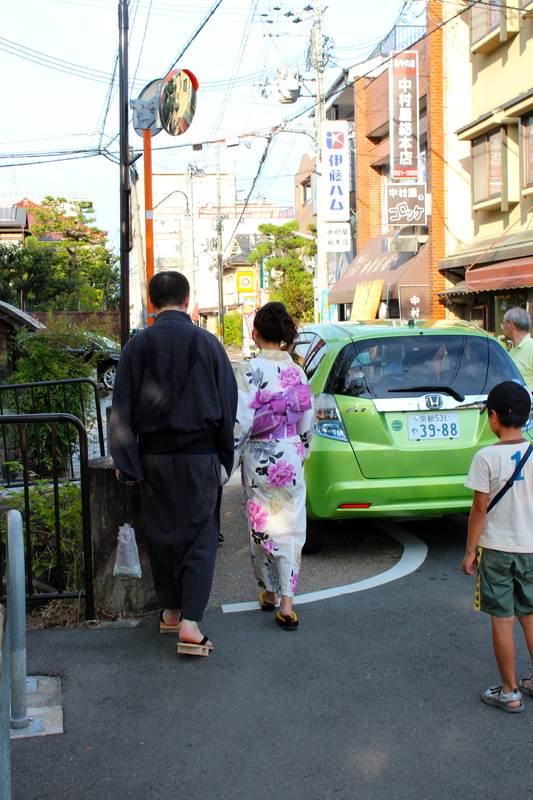 We had just arrived in Kyoto that afternoon and decided to venture around our neighborhood. We found ourselves right across from the Tenryu-ji in Susukinobaba-chō, Ukyō Ward, Kyoto, Japan, a UNESCO world heritage sight. We decided to explore it another day and turned left on the intersection. 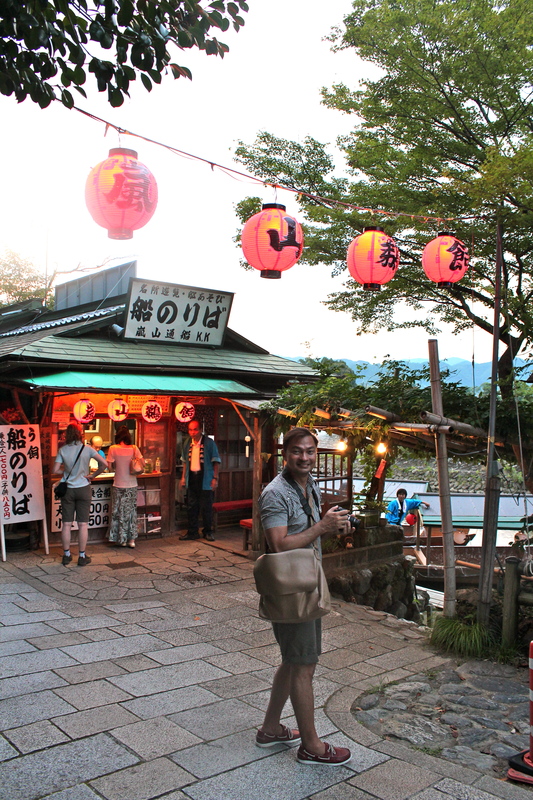 I was welcomed with a throng of girls dressed in their Yukata. Suddenly everywhere I turned, there are lots of girls in their Yukata! It’s like watching colorful flowers bloom under the summer sun. It is indeed a sight to behold. If one decides to travel to Japan in the summer, I believe one of the best sights that awaits you are the Yukata girls. It amazes me that such tradition lives in a modern society. It is perfectly okay to have your photo taken with them! They look forward to it. Just approach them, ask kindly and you will be rewarded. to view the complete album (on my facebook), click here. This is how it feels like to be inside a bullet train. We rode on the Nozomi Shinkansen. It runs at 300km/h. This is only 32 seconds of a 2 hour and 15 minute trip. Another friendly reminder from your TOR GUIDE. Always make sure to get vaccinated before flying out! It helps to be healthy while traveling throughout another foreign country. Got my Flu shot today! Perfect timing for I’m leaving for Japan tomorrow.